Rawhide, Love, and Happy Trails! As the pastor of a small parish, I’m accustomed to what lots of ministers would consider a light wedding schedule. Well, in 2014 either “Trumpet Voluntary” is in the water or word is leaking out that my wedding homilies are pithy and I’ll give you your vows in nibbles so you don’t fumble them and the Lutheran service for marriage includes minimal fluff. If you’re not lighting candles or pouring colored sand or passing out roses or “there is love[ing],” I can get you hitched in fifteen minutes. 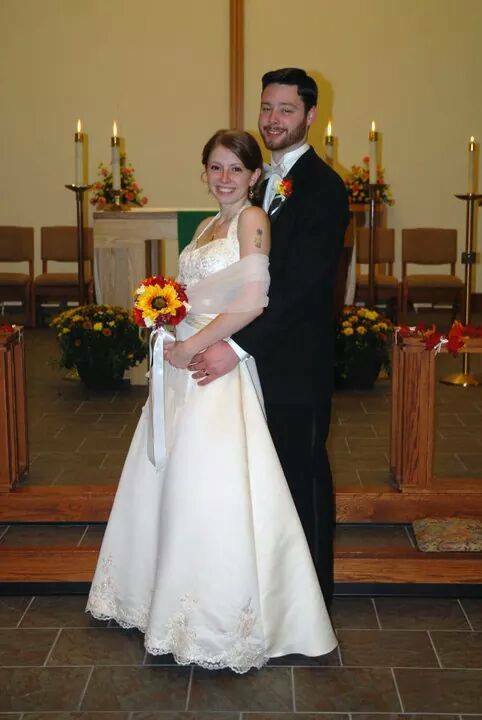 Daughter Elena and son-in-law Matt: I officiated their nuptials in around twenty minutes ago on October 2, 2010. No fuss, no muss. Rollin’, rollin’, rollin’, keep them vows a rollin’, rawhide . . . to Saxonburg, Pennsylvania. Rain and wind and weather . . . to Shippenville, Pennsylvania. Hell bent for [tether] . . . to Findley Lake, New York. Wishin’ my gal was by my side . . . to Columbiana, Ohio. But last Saturday as I was driving through Ohio, minding my own business, the dying leaves got through to me. Trees lining the highway sang out every lovely cliché of autumn. It was as if creation cleared scales from my eyes, and I saw colors. Pandora’s “Zen Garden” station—serenity now!—had my ears calmed down. And as the miles unraveled, I traveled into thanksgiving. Turns out the space behind my chest that shelters laughter and tears also rents out a secret loft to a tenant who has become unkempt and dusty lately: gratitude. Thanks for Don and Janine Thompson, grandson Cole’s other grandparents. The little man spends a lot of time at their place, in part because they live a few doors up on the same street as Elena and Matt. Janine is always chasing the Cole-meister while full-time-mom Elena runs errands or takes an exit for some rest. I’ve seen with my eyes and felt in my bones their bottomless, gentle love for our boy. Knowing that he toddles around at Don and Janine’s house invites in me a cleansing breath. He is safe, spoken to with tenderness, and regarded with patience and generosity. As a bonus, Cole is picking up a couple of fantastic lessons for life from his other grandparents. 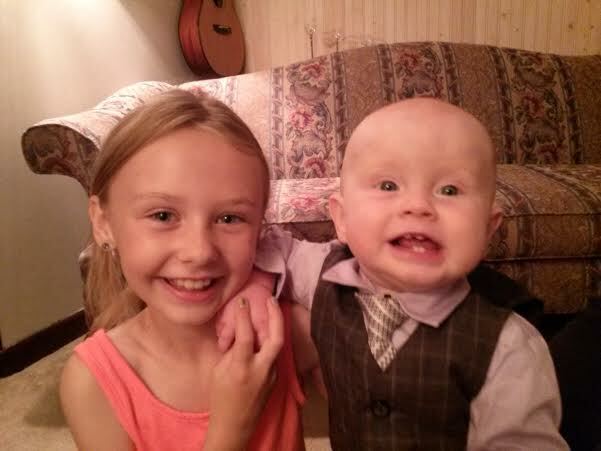 A big bonus at Grandma and Grandpa Thompson’s is cousin Shaylee, who loves Cole like crazy and comes to play. 1.) The Thompson house is trippy. Every time I drive by I chuckle a loving, admiring chuckle. It’s a typical ranch house, very well kept and attractive, but it has an addition on the roof that makes the place look like a thick letter “L” lying on its back. But here’s the thing: Don pretty much built the whole place himself. When the family needed more room, he added where he could. I dig that and am glad Cole is doing part of his growing up there because he can learn that what matters most isn’t the way a home is shaped on the outside, but the grace and care that fills the inside. 2.) Along these same lines, Matt told me that his dad painted his car or truck with, well, a paint brush. You can hardly tell. Every summer the Thompsons have a bodywork day when all the cars in the family get what they need. I love this! Don once told Matt never to buy a new car when you can fix an old one. He’s right. I want my little Cole-mobile to grow up believing that a car’s primary job is to roll him somewhere. 3.) Rounding a bend here: During Elena and Matt’s engagement, there was a brief point of tension between Elena and Janine. I don’t even know what it was about, but I know how it ended. They talked it out and learned from each other. So a mother-in-law genuinely listened to her perky whippersnapper future daughter-in-law, took a look within, and was vulnerable and open. 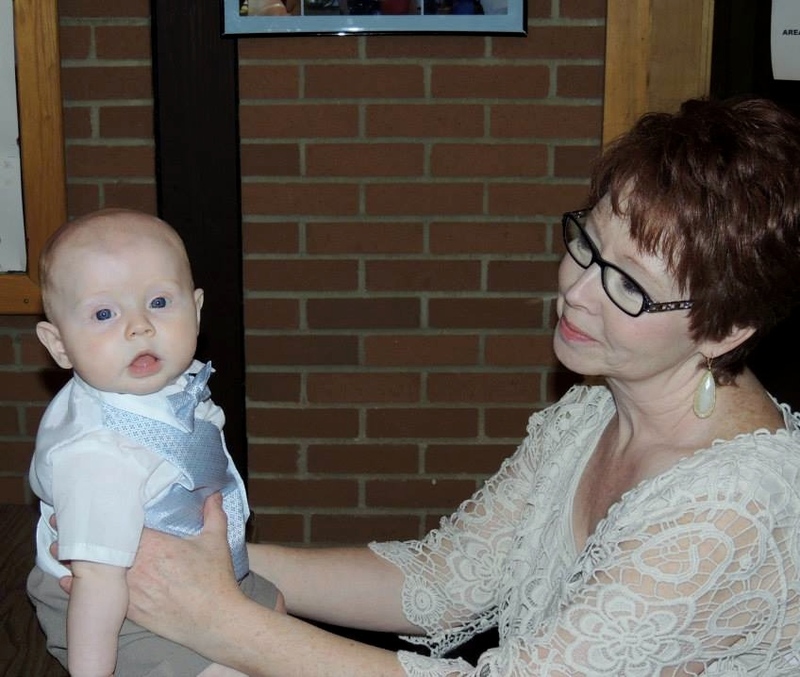 Now, this is a woman I want in my grandson’s life! A healthy, wise presence. 4.) When you put together everything in the Thompson’s cool-beans household, you also get another piece of first-rate craftsmanship. Thanks for Matt Thompson! Son-in-law Matt is like his old man: intelligent, thoughtful, conversant on an amazing number of topics, but at the same time doesn’t take up a lot of space. When he comes into a room, his countenance doesn’t shout, “Here I am!” It smiles, “There you are!” All of my neighbors once agreed—the men, too—that we want to marry Matt. This Renaissance Man could build aircraft carrier out of gravel, twigs, hair, and boogers, and, in fact, he and Elena bought what was essentially a 800-square-foot dog kennel, gutted the yuck out of it, and made it their home. Matt knows everything about inventor Nicola Tesla, including I believe the circumference of his nostrils, and quotes Carl Sagan all the time. He refurbished the 1980 electric Commuticar wife Kathy drives to work and once explained how the batteries charge and alternate their responsibilities. I listened politely as Charlie Brown’s teacher’s wha, wha, wha, ah, ah, wha, wha came out of his mouth. Matt and Cole: lucky man, lucky boy! However, the fact that Matt Alan Thompson could perform brain surgery in the dark with balsa wood instruments is beside the point. He is a good man with a conscience and a large soul. 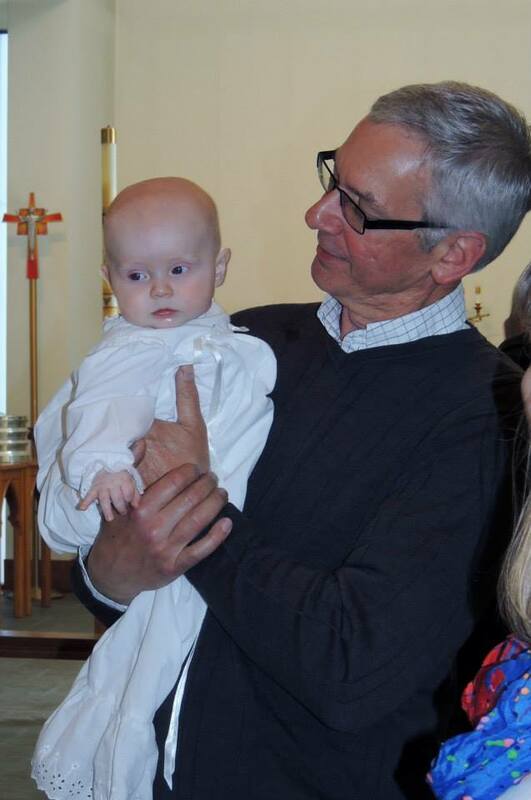 Best of all, when he holds my grandson, he knows that he is in possession of a fragile blessing. I can tell. 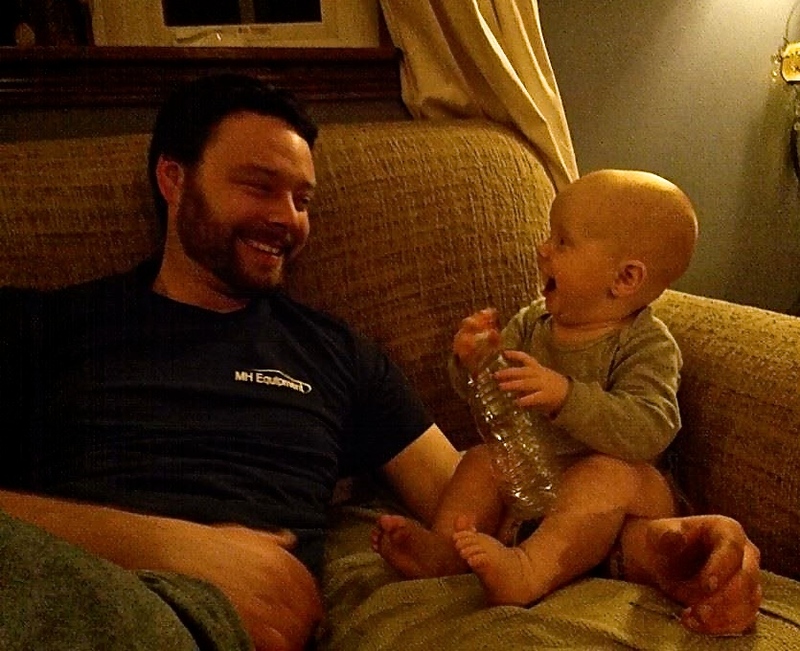 Matt’s thick hands loosen rusty bolts, but their grip on that baby is soft and kind. And he talks to Cole the same way he carries him. 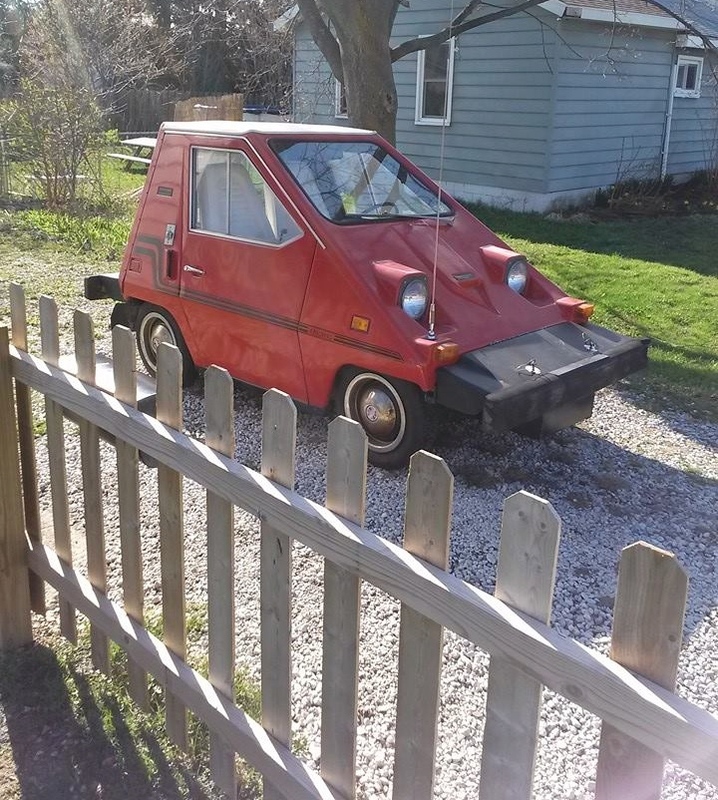 The 1980 Electric Commuticar, which the Coleman family dubbed the Goudalet because one person observed that it looks like a wedge of gouda cheese rolling down the street. It lay dormant for over twenty years, but Matt willed it back to life. Well, enough about my son-in-law. He chose to marry my daughter, so my neighbors and I have to accept that we don’t stand a chance with him. 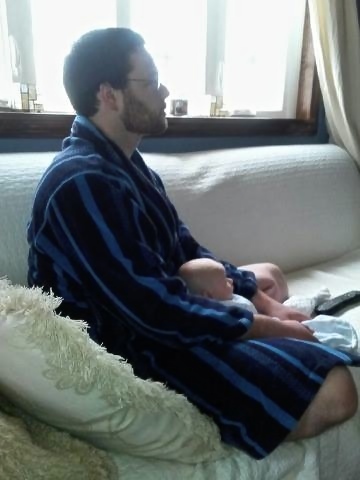 Matt and baby Cole watching an old episode of “Cosmos”–no kidding! With another forty minutes to go on Route 6, I seemed to herd other reasons for thanks ahead of me like doggies. Don’t try to understand ‘em, just rope and throw and brand ‘em. Right, then, just enjoy the yips of gratitude. Thanks for Kathy, Elena, and Micah. I’ve fussed over them in other posts. I remain grateful. Thanks for my church kids. Most Sundays they’re a mosh pit of rosy-cheeked silliness. We love each other. Austin sees Pastor John sit down with the kids to listen to music. 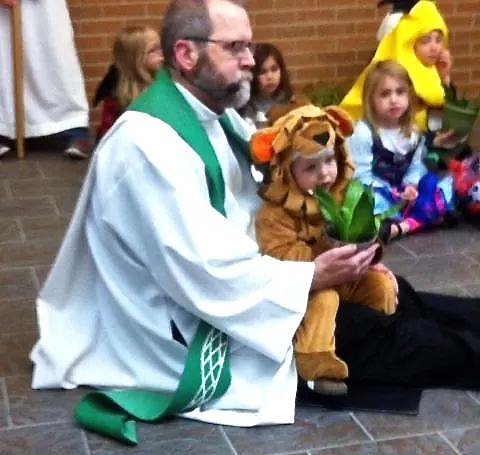 Austin puts his Halloween costume in reverse and sits down on Pastor John’s lap. Pastor John looks like he is frowning, but he is not. His eyes are closed because he is sitting in God’s lap. Thanks for my blogging friends. Beyond their sincere care for me and each other, I appreciate my fellow bloggers’ patience. We seem to understand and accept when one or another of us drops off the grid for a while because good vittles, love, [or] kissin’ has somehow gone a-missin’. They are unseen guests in my days—great company. And thanks for the leaves. Gorgeous, yet in extremis. Their reality gives me hope. On the doorstep of dust, they sing their loudest. Do they see something we don’t? Maybe as they fall to earth, they know they’ll go on living high and wide. Oh what a perfect read after a long and hard week here in Canada, John. I’ve witnessed so much good here to overcome the heinous acts of Monday and Wednesday, and here I find myself weepy, reading this amazing and uplifting post. Thank you! p.s. I love “Whelming”. I’m totally adopting it! Right back at you, sister. Wonderful insight into the other side of the family! I hear lots of positive things to be shared with Cole one day! Now, if only he will appreciate these virtues and strengths! I so wished I had payed attention to my dad’s talents I’d be like your wife ready and able to tackle all kinds jobs! Loved the tiling in the BR, I believe? Can’t imagine what else! And gratitude for your spirit, brother. What an inspiring post, John. You obviously have so many blessings in your life and your family and community is blessed to have you in it. I love your line about being a tenant in your chest! Lovely. I sit in my house, which is still in shambles, feeling like I have jet-lag in the afterglow of wedding #8. I try not to think too much about planning because something usually goes awry and I am disappointed. A week ago I was feeding a couple dozen people (my village) in my kitchen, was mother of the bride, then hosted 120 people for brunch in the barn. The weekend was not perfect, I forgot some things. The blessings I received on Saturday were overwhelming though. My village was there and as the bride told me, “Mom as I walked down the aisle I saw all the people that love me.” That was plenty, but then we started the wedding service that John so flippantly throws out there as a quick wedding. I did not want him to stop talking. Sometimes in church you start thinking, I need to pick up eggs, bread, milk…John you had us all deeply engaged with your words. You had me with, no matter what is said it is all about God. When a non-churched friend told the bride he really liked the service she laughed and asked, “why because it was short”. His response was that he liked the message! I am in awe as I realized that your officiating at wedding #8 was secondary to spreading the seeds God has given you for his purpose. I feel very blessed and excited to have been part of that. As an added bonus my village is getting bigger too! Thank you for the joy!